COMBINE: Sugar, corn syrup, butter and bring to a boil over medium heat, let boil one minute stirring constantly. Let mixture cool (about 5 minutes) while beating eggs. Add nuts to eggs. Slowly add ‘hot’ mixture stirring until smooth. Pour into warm, pre-baked pie shell. Bake for exactly 40 minutes (no longer). 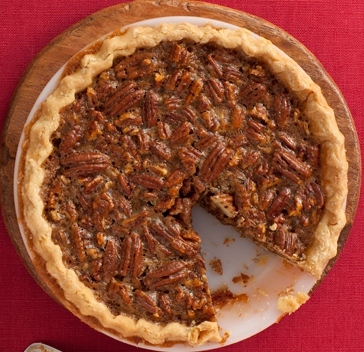 Serve warm with dollop of Cool Whip, Whipped Cream or ice cream (Praline is nice).